It’s been a long, hot summer here in the Pacific NW, the kind of weather Grammie used to call the dog days of Summer. So I decided to see what’s up with that term. According to my research source of first resort, Wikipedia, ‘the phrase Dog Days or “the dog days of summer”, Latin: Caniculae or Caniculares dies, refers to the hottest, most sultry days of summer.’ I never stop with Wiki, btw, but it’s a good start, and there are usually outside links at the bottom of each article. In this case, none of the links were all that useful, but one was to another Wiki page, and from *that* one, I found something good. 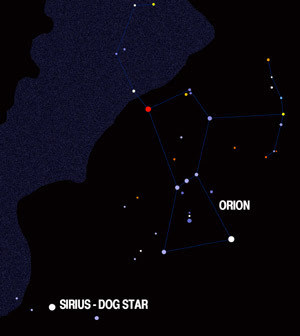 Traditionally the Dog Days are the 20 days before and after the Sun/Sirius conjunction. Nowadays, that’s roughly from July 5 to August 10 (northern hemisphere), but because of astronomical precession, it’s changed over the years; in ancient times, it was somewhat later, more like mid/late-July to early September. (Wilstar). Whenever the Dog Days fell, however, they were thought to be foul times, “when the seas boiled, wine turned sour, dogs grew mad, and all creatures became languid, causing to man burning fevers, hysterics, and phrensies” (Clavis Calendarium, 1813, as quoted on Wiki). Up north in Sweden and Finland, they call this part of summer “the rotting time” because the food spoiled in the heat. He carried his own low temperature always about with him; he iced his office in the dogdays; and didn’t thaw it one degree at Christmas. Finally, while poking around, I found a little video called “Dog Days” by Florence and the Machine. Unfortunately, Flo disabled embedding, so you’ll have to go look here. So there you have an example of how I wander, finding odd bits and pieces here and there. And I never even got past the first page of Google search on this. Imagine if I’d really been serious (serious…snort) about the whole thing and you’ll get a hint at why I turn out books so flippin’ slowly. So ultimately, this is about procrastination. Useful, intellectually stimulating procrastination, but procrastination nonetheless. What’s your favorite way to “work” without actually doing the work? I love getting caught up in research like this, Lisa. I’ll stop to look stuff up, like how many diamonds would make up a million dollars, and time just shifts into another dimension. When I finally look up, I’m amazed at how much time has passed. And I’m especially glad August is drawing to a close. We’ve been having dog days all summer. Enough is enough! Come on fall. I’m procrasting just being here. And that must be why I turn out books so flipping slowly, too. I love to research. I’m in the zone as much with research as with writing or editing. We had about six days of summer here, Maggie, and they were all dog days. That would be procrastinating. Duh.